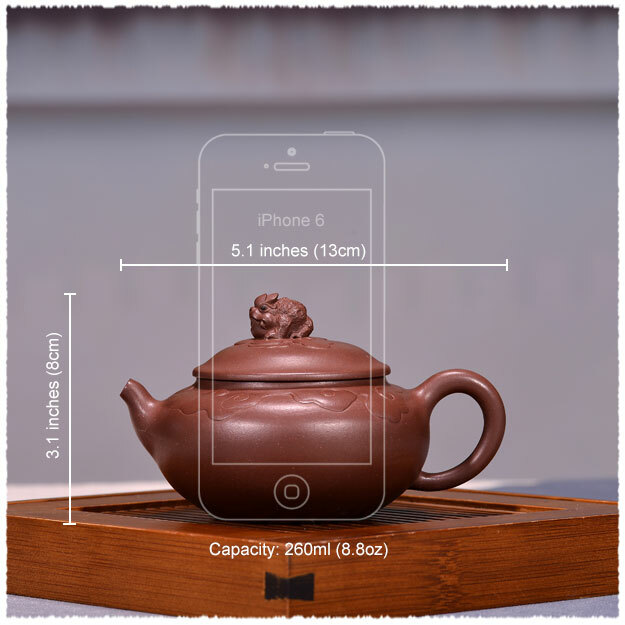 Tian Chan and clouds blend with the body of teapot, which has unique modeling and fine production. This Zisha Teapot is used the purple clay from Yixing as the raw material and the traditional teapot maker carefully applies animals in nature to it. The Tian Chan on the lid is vivid with a pair of bright piercing eyes. Same as Pi Xiu, Tianchan is also a symbol of auspiciousness, the gaining of wealth and good fortune in China. Its spout is slightly bent and naturally connects with the body of teapot. The handle of teapot is comfortable to hold and the overall shape is exquisite, which has high collection value.